Long-standing majority control like the kind that the Democrats lost in the 1994 midterm elections increases the power of incumbents, attracting more political money. From 1980 to the present, the southern congressional delegation has been the chief engine of change in the national flow of money and votes. As solid Democratic control eroded with the development of the modern Sunbelt South, party competition revived. As the number of southern Republican incumbents increased, their fundraising success increased. Fundraising success helped put more Republicans in office. In 1994, Newt Gingrich (R-GA) used his fundraising resources to elect a largely southern bloc of new Republican representatives. 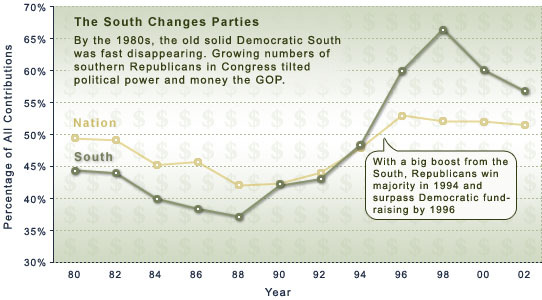 The '94 freshman class of Republicans gave their party the House majority, elected Gingrich Speaker of the House, and brought Republicans a majority of political money--dramatically so in the South, as the steep rise in the green "South" line added to the chart illustrates. Full Source: Data compiled and calculated from biennial Federal Election Commission (FEC) data downloaded from http://www.fec.gov.